Monday morning was very frosty indeed. On Sunday afternoon the pond was still frozen solid, so it was clear it would be a heavy frost- I think everything looks so pretty when it is covered in white- even the cars! Anyway, welcome to another WIAW and head over to Peas and Crayons if you fancy having a nose at what other people are eating. So I went for a massive mug of peppermint tea to warm me up. Breakfast– muesli, apple, soya milk, peppermint tea. I did brave a little walk outside, and was hungry for my lunch after that- partly from the cold I think. Toasted sourdough with mixed nut butter and blackcurrant spread, grapes, and satsumas. That sourdough was sooooooo good- we had some at the weekend but I think it was even better toasted. If I lived in San Francisco I would visit Boudins every day. A few chocolate pecans and a tea-pigs latte. Can you see the heart shape? I will get better! Love the Aerolatte for the froth! Not sure what it was! It was from the freezer and it was not labelled (I normally label everything)- it seemed to be giant cous cous, black eye beans, carrots, sweet potato, peppers, tomatoes… It was tasty anyway. With rocket and nutritional yeast. From here. I do find the actual video rather funny (especially when he phones the girl), plus I love silly puns, and I love tea! I think I had about 5 cups of tea that day- peppermint, vanilla rooibos, raspberry, peach, spiced winter…. I needed it to stay warm. What is your favourite warm drink? Haha! That teapot is HILARIOUS! Ohmygosh those chocolate pecans look amazing! I need some of those in my life! My fave hot drink is either normal (English breakfast) tea or hot chocolate! I love coffee but I like it more for it’s caffeine than taste! Ha love the teapot! i’m a big tea and hot choc fan to keep me warm. My ‘default’ tea has always been a nice cup of earl grey but when the weather is cold like this I like to add in some fruit and herbal teas. I could drink earl grey and coffee all day long but I don’t like the thought of all that caffiene and having to add milk every time. I also love spiced teas like chai, and your vanilla rooibos sounds nice too. LMFAO. 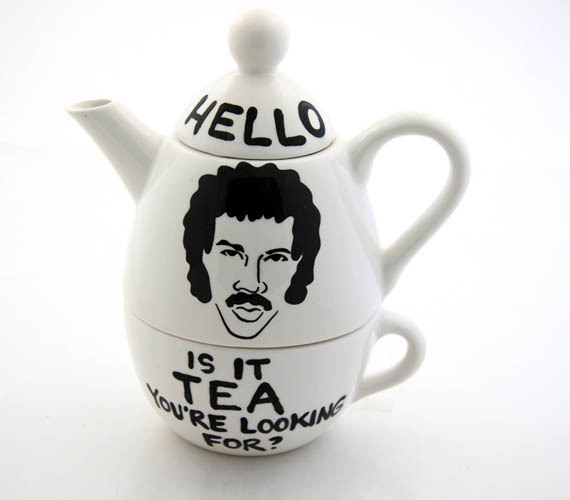 i would have consumed a dramatic amount of tea if lionel richie graced the surface of my teapot, too. hahahahahahaha! Glad you all liked the teapot 🙂 Made me chuckle too. Bronagh- Waitrose do the vanilla rooibos tea (their “Love life” range or something)- think it was 99- for 20 or something. It is tasty too. I think I drink about 8 large cups of tea a day at least, its an ongoing joke at work how much I drink! I love my green tea of course then I go through phases with others. At the moment I’m on a peppermint kick! That tea pot is cool! I like minty teas and fruity ones too. TBH, I’m not picky with tea at all. I’ll drink pretty much anything. I am partial to a good old proper tea with milk as well. That’s probably my favourite warming tea! Oh God, the tea thing made me wince and cringe a little in the best possible way – I do love a good pun. Monday was bloomin freezing up here too – my toes nearly dropped off when I was out on my bike for a bit. I love the teapot, awesome! Been meaning to try an aerolatte for ages as well. Haha I love that teapot! My favourite hot drink has to be some sort of herbal tea. I really like peppermint and at the moment I am loving Clipper orange and coconut tea. I like the sound of chocolate pecans – anything by Montezuma is usually delicious. Ha ha I saw that picture on Facebook a few weeks ago and loved it! Tea is most definitely my favourite drink! My mom got some of those chocolate pecans for Christmas, and they were amazing! I think I ate almost all of them by myself! I love the sound of orange and coconut tea- will have to look out for that one. I have some mandarin and ginger tea which is lovely. The pecans came from the Montezuma’s online shop- I went to look, must have signed up for an email, and didn’t order anything, then a bit later they sent me an email saying they noticed I visited the site but didn’t buy anything, so sent me a 10% off voucher. Well, it was rude not to use it surely! It’s been really cold here too! I’m so ready for the Summer!